Umbrellas are for sissies! A man wears a rain suit. (Incidentally, if you are a sissy, check out this really cool umbrella that was featured on Regis and Kelly.) For you men, read on… GRRRRRRRR! It's January, and you're golfing in the great Northwest. It's 39 degrees, and it hasn't stopped raining since November. Your shoes are caked in mud. Your lips are blue, and your golf bag is full of water. After putting out, your best golf buddy looks up at you sheepishly and asks if you want to continue. To which you reply, "Yah, let's go ahead and play the 2nd hole." Welcome to my world! 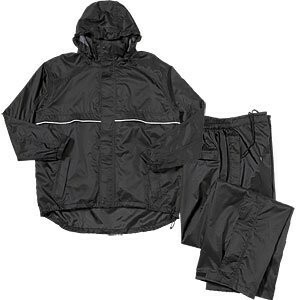 This Weather Company Rain suit is reasonably priced and will do the trick and keep you dry. It's made of 100% nylon. The rain jacket has a zipper with Velcro and a snap storm flap. It is vented so you don't sweat to death, and it has two hidden zipper pockets and two zippered front pockets to keep your tees and ball markers in. The rain pants have a snap front closure with a zipper. The waist is secured with a draw string and an elastic back. They also have zippered pockets and have a mesh lining down to your knee. This is a good rain suit, but I prefer the Frogg Toggs Pro Action Classic Suit better. The Frogg Toggs breathes better, and it's also more lightweight and folds up more compact.